Below is an excerpt from chapter two, “From the Philosophy of the Open to the Ideology of the User-Friendly,” from my book Reading Writing Interfaces: From the Digital to the Bookbound (University of Minnesota Press 2014). It is also the basis of the talk I gave at MLA in January 2013 and the full version of the talk I gave at Counterpath Press February 2013. As always, I welcome your comments! Despite studies released since 1985 that clearly demonstrate GUIs are not necessarily better than command-line interfaces in terms of how easy they are to learn and to use, Apple – particularly under Jobs’ leadership – successfully created such a convincing aura of inevitable superiority around the Macintosh GUI that to this day the same “user-friendly” philosophy, paired with the no longer noticed closed architecture, fuels consumers’ religious zeal for Apple products. I have been an avid consumer of Apple products since I owned my first Macintosh Powerbook in 1995; but what concerns me is that ‘user-friendly’ now takes the shape of keeping users steadfastly unaware and uninformed about how their computers, their reading/writing interfaces, work let alone how they shape and determine their access to knowledge and their ability to produce knowledge. As Wendy Chun points out, the user-friendly system is one in which users are, on the one hand, given the ability to “map, to zoom in and out, to manipulate, and to act” but the result is a “seemingly sovereign individual” who is mostly a devoted consumer of ready-made software and ready-made information whose framing and underlying mechanisms we are not privy to. 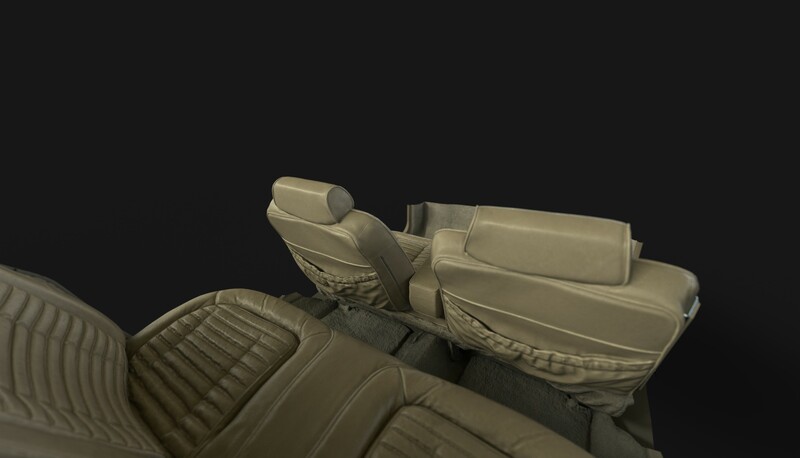 However, it’s not necessarily the GUI per se that is responsible for the creation of Chun’s “seemingly sovereign individual” but rather a particular philosophy of computing and design underlying a model of the GUI that has become the standard for nearly all interface design. The earliest example of a GUI-like interface whose philosophy is fundamentally different from that of the Macintosh is Douglas Engelbart’s NLS or “oN-Line System” which he began work on in 1962 and famously demonstrated in 1968. While his “interactive, multi-console computer-display system” with keyboard, screen, mouse, and something he called a chord handset is commonly cited as the originator of the GUI, Engelbart wasn’t so much interested in creating a user-friendly machine as he was invested in “augmenting human intellect”. As he first put it in 1962, this augmentation meant “increasing the capability of a man to approach a complex problem situation, to gain comprehension to suit his particular needs, and to derive solutions to problems”. The NLS was not about providing users with ready-made software and tools from which they choose or consume but rather it was about bootstrapping, or “the creation of tools for expert computer users” and providing the means for users to create better tools, or tools better suited for their own individual needs. We can see this emphasis on tool-building and customization that comes out of an augmented intellect in Engelbart’s provision of “view-control” (which allows users to determine how much text they see on the screen as well as the form of that view) and “chains of views” (which allows the user to link related files) in his document editing program. Underlining the fact that the history of computing is resolutely structured by stops, starts, and ruptures rather than a series of linear firsts, in the year before Engelbart gave his “mother of all demos,” Seymour Papert and Wally Feurzeig began work on a learning-oriented programming language they called ‘Logo’ that was explicitly for children but implicitly for learners of all ages. Throughout the 1970s Papert and his team at MIT conducted research with children in nearby schools as they tried to create a version of Logo that was defined by “modularity, extensibility, interactivity, and flexibility”. At this time, the Apple II was the most popular home computer throughout the late 1970s until the mid-1980s and, given its open architecture, in 1977 Logo licensed a public version for Apple II computers as well as for the less popular Texas Instruments TI 99/4. In 1980, Papert published the decidedly influential Mindstorms: Children, Computers, and Powerful Ideas in which he makes claims about the power of computers that are startling for a contemporary readership steeped in an utterly different notion of what accessible or user-friendly computing might mean. Describing his vision of “computer-aided instruction” in which “the child programs the computer” rather than one in which the child adapts to the computer or even is taught by the computer, Papert asserts that they thereby “embark on an exploration about how they themselves think…Thinking about thinking turns the child into an epistemologist, an experience not even shared by most adults” (19). And two years later, in a February 1982 issue of Byte magazine, Logo is advertised as a general-purpose tool for thinking with a degree of intellectuality rare for any advertisement: “Logo has often been described as a language for children. It is so, but in the same sense that English is a language for children, a sense that does not preclude its being ALSO a language for poets, scientists, and philosophers”. Moreoever, for Papert thinking about thinking by way of programming happens largely when the user encounters bugs in the system and has to then identify where the bug is to then remove it: “One does not expect anything to work at the first try. One does not judge by standards like ‘right – you get a good grade’ and ‘wrong – you get a bad grade.’ Rather one asks the question: ‘How can I fix it?’ and to fix it one has first to understand what happened in its own terms.” (101) Learning through doing, tinkering, experimentation, trial-and-error is, then, how one comes to have a genuine computer literacy. The movement of computers into people’s homes makes it important for us personal systems users to focus our efforts toward having computers do what we want them to do rather than what someone else has blessed for us…When computers move into peoples’ homes, it would be most unfortunate if they were merely black boxes whose internal workings remained the exclusive province of the priests…Now it is not necessary that everybody be a programmer, but the potential should be there…(90). It was precisely the potential for programming or simply novice as well as expert use via an open, extensible, and flexible architecture that Engelbart, Papert and Kay sought to build into their models of the personal computer to ensure that home computers did not become “merely black boxes whose internal workings remained the exclusive province of the priests.” By contrast, as Kay later exhorted his readers in 1977, “imagine having your own self-contained knowledge manipulator in a portable package the size and shape of an ordinary notebook”. Designed to have a keyboard, an NLS-inspired “chord” keyboard, mouse, display, and windows, the Dynabook would allow users to realize Engelbart’s dream of a computing device that gave them the ability to create their own ways to view and manipulate information. Rather than the over-determined post-Macintosh GUI computer which has been designed to pre-empt every user’s possible need with the creation of an over-abundance of ready-made tools such that “those who wish to do something different will have to put in considerable effort,” Kay wanted a machine that was “designed in a way that any owner could mold and channel its power to his own needs…a metamedium, whose content would be a wide range of already-existing and not-yet-invented media” (403). More, Kay understood from reading Marshall McLuhan, that the design of this new metamedium was no small matter for the very use of a medium changes an individual’s, a culture’s, thought patterns. Clearly, he wanted thought patterns to move toward a literacy that involved reading and writing in the new medium instead of the unthinking consumption of ready-made tools, for, crucially, “the ability to ‘read’ a medium means you can access materials and tools created by others. The ability to ‘write’ in a medium means you can generate materials and tools for others. You must have both to be literate”. …this encounter finally hit me with what the destiny of personal computing really was going to be. Not a personal dynamic vehicle, as in Engelbart’s metaphor opposed to the IBM “railroads”, but something much more profound: a personal dynamic medium. With a vehicle one could wait until high school and give “drivers ed”, but if it was a medium, it had to extend into the world of childhood (“The Early History” 81). …the new user of a Smalltalk system is likely to begin by using its ready-made application systems for writing and illustrating documents, for designing aircraft wings, for doing homework, for searching through old court decisions, for composing music, or whatever. After a while, he may become curious as to how his system works. He should then be able to “open up” the application object on the screen to see its component parts and to find out how they work together (166). Image by Adele Goldberg contrasting the conventional philosophy of software driven by “wizards” in Figure 1 versus that provided by Smalltalk for the benefit of the programmer/user in Figure 2. The Taj Mahal in Figure 1 “represents a complete programming environment, which includes the tools for developing programs as well as the language in which the programs are written. The users must walk whatever bridge the programmer builds” (Goldberg 18). 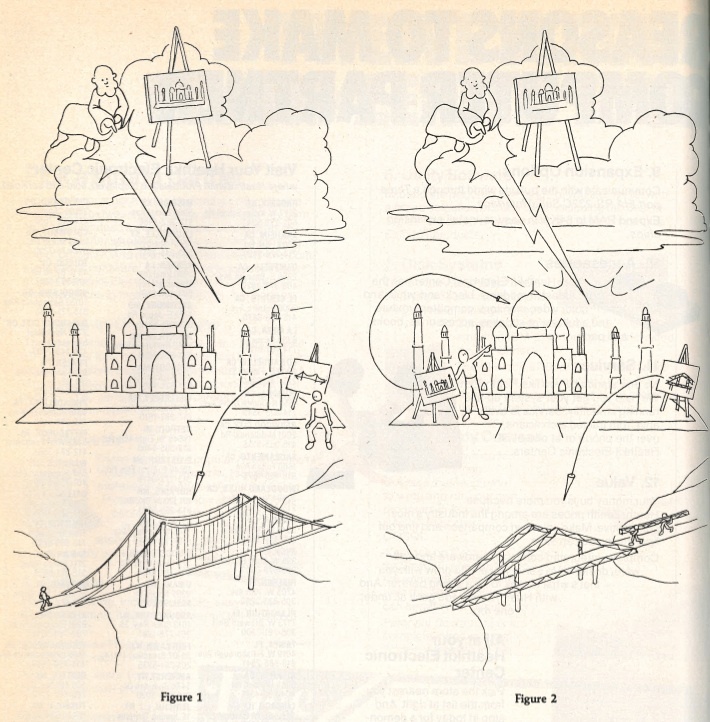 Figure 2, by contrast, represents a Taj Mahal in which the “software priest” is transformed into one who merely provides the initial shape of the environment which programmers can then modify by building “application kits” or “subsets of the system whose parts can be used by a nonprogrammer to build a customized version of the application” (18). The user or non-programmer, then, is an active builder in dialogue with the programmer instead of a passive consumer of a pre-determined (and perhaps even over-determined) environment. At roughly the same time as Kay began work on Smalltalk in the early 1970s, he was also involved with the team of designers working on the NLS-inspired Xerox Alto which was developed in 1973 as, again, an “interim Dynabook” with a three-button mouse, a GUI which worked in conjunction with the desktop metaphor, and ran Smalltalk. While only several thousand non-commercially available Altos were manufactured, it was – as team members Chuck Thacker and Butler Lampson believe – probably the first computer explicitly called a “personal computer” because of its GUI and its network capabilities. By 1981, Xerox had designed and produced a commercially available version of the Alto, called the 8010 Star Information System, which was sold along with Smalltalk-based software. 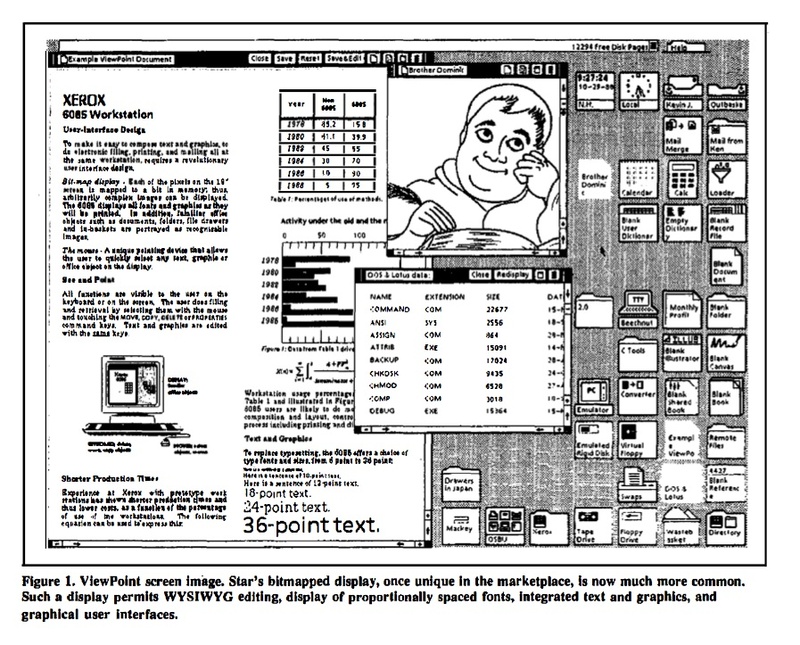 But as Jeff Johnson et al point out, the most important connection between Smalltalk and the Xerox Star lay in the fact that Smalltalk could clearly illustrate the compelling appeal of a graphical display that the user accessed via mouse, overlapping windows, and icons (22). By contrast, as I’ll now talk about, the Apple Macintosh was clearly designed for consumers, not creators. It was marketed as a democratizing machine when in fact it was democratizing only insofar as it marked a profound shift in personal computing away from the sort of inside-out know-how one needed to create on an Apple II to the kind of perfunctory know-how one needed to navigate the surface of the Macintosh – one that amounts to the kind of knowledge needed to click this or that button. The Macintosh was democratic only in the manner any kitchen appliance is democratic. That said, Apple’s redefinition of the overall philosophy of personal computing exemplifies just one of many reversals that abound in this ten year period from the mid-1970s to the mid-1980s. In relation to the crucial change that took place in the mid-1980s from open, flexible, and extensible computing systems for creativity to ones that were closed, transparent, and task-oriented, the way in which the Apple Macintosh was framed from the time of its release in January 1984 represented a near complete purging of the philosophy promoted by Engelbart, Kay, and Papert. This purging of the recent past took place under the guise of Apple’s version of the user-friendly that, among other things, pitted itself against the supposedly “cryptic,” arcane,” “phosphorescent heap” that was the command-line interface as well as, it was implied, any earlier incarnation of the GUI. However, it’s important to note that, while the Macintosh philosophy purged much of what had come before, it did in fact emerge from the momentum gathering in other parts of the computing industry which were particularly concerned to define standards for the computer interface. 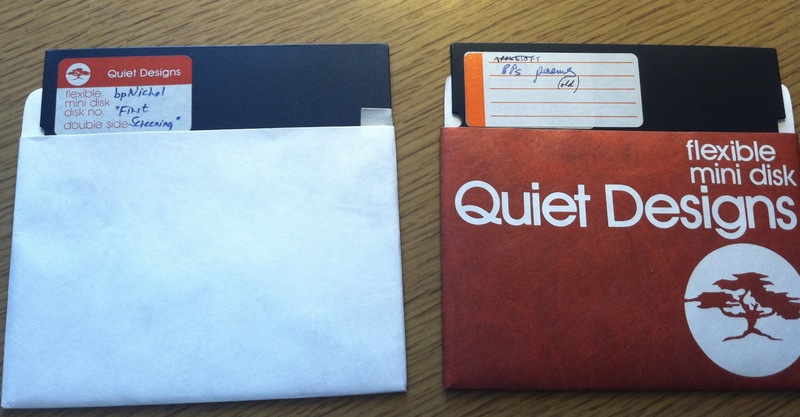 Up to this point, personal computers were remarkably different from each other. Commodore 64 computers, for example, came with both a ‘Commodore’ key that gave the user access to an alternate character set as well as four programmable function keys that, with the shift button, could each be programmed for two different functions. By contrast, Apple II computers came with two programmable function keys and Apple III, IIc and IIe computers came with open-Apple and closed-Apple keys that provided the user with shortcuts to applications such as cut-and-paste or copy (in the same way that the contemporary ‘command’ key functions). No doubt in response to the difficulties this variability posed to expanding the customer base for personal computers, Byte magazine ran a two-part series in October and November 1982 dedicated to the issue of industry standards by way of an introduction to a proposed uniform interface called the “Human Applications Standard Computer Interface” (or HASCI). Asserting the importance of turning the computer into a “consumer product,” author Chris Rutkowski declares that every computer ought to have a “standard, easy-to-use format” that “approaches one of transparency. The user is able to apply intellect directly to the task; the tool itself seems to disappear” (291, 299-300). Of course, a computer that is easy-to-use is entirely desirable; however, at this point ease-of-use is framed in terms of the disappearance of the tool being used in the name of ‘transparency ‘ – which now means usersfwhi can efficiently accomplish their tasks with the help of a glossy surface that shields them from the depths of the computer instead of the earlier notion of ‘transparency’ which referred to a usesr’s ability to open up the hood of the computer to understand directly its inner workings. Thus, no doubt in a bid to finally produce a computer that realized these ideas and appealed to consumers who are “drivers, not repairmen,” Apple unveiled the Lisa in June 1983 for nearly $10,000 (that’s $23,000 in 2012 dollars) as a cheaper and more user-friendly version of the Xerox Alto/Star which sold for $16,000 in 1981 (which is about $40,000). At least partly inspired by Larry Tesler’s Xerox PARC 1979 demo of the Star to Steve Jobs, the Lisa used a one-button mouse, overlapping windows, pop-up menus, a clipboard, and a trashcan. As Tesler was adamant to point out in a 1985 article on the “Legacy of the Lisa,” it was “the first product to let you drag [icons] with the mouse, open them by double-clicking, and watch them zoom into overlapping windows” (17). The Lisa, then, moved that much closer to the realization of the dream of transparency with, for example, its mode of double-clicking that attempted to have users develop the quick, physical action of double-clicking that bypasses the intellect through physical habit; more, its staggering two 2048K worth of software and three expansion slots also firmly moved it in the direction of a readymade, closed consumer product and definitively away from the Apple II, which, when it was first released in 1977, came with 16K bytes of code and, again, eight expansion slots. Expansion slots symbolize the direction that computing was to take from the moment the Lisa was released, followed by the release of the Macintosh in January 1984, to the present day. Jeff Raskin, who originally began the Macintosh project in 1979, and Steve Jobs both believed that hardware expandability was one of the primary obstacles in the way of personal computing having a broader consumer appeal. In short, expansion slots made standardization impossible (partly because software writers needed consistent underlying hardware to produce widely functioning products) whereas what Raskin and Jobs both sought was a system which was an “identical, easy-to-use, low-cost appliance computer.” At this point, customization is no longer in the service of building, creating or learning – it is, instead, for using the computer as one would any home appliance and ideally this customization is only possible through software that the user drops into the computer via disk just as they would a piece of bread into a toaster. Predictably, then, the original plan for the Macintosh had it tightly sealed so that the user was only free to use the peripherals on the outside of the machine. While team-member Burrell Smith managed to convince Jobs to allow him to add in slots for users to expand the machine’s RAM, Macintosh owners were still “sternly informed that only authorized dealers should attempt to open the case. Those flouting this ban were threatened with a potentially lethal electric shock”. That Apple could successfully gloss over the aggressively closed architecture of the Macintosh while at the same time market it as a democratic computer “for the people” marks just one more remarkable reversal from this period in the history of computing. 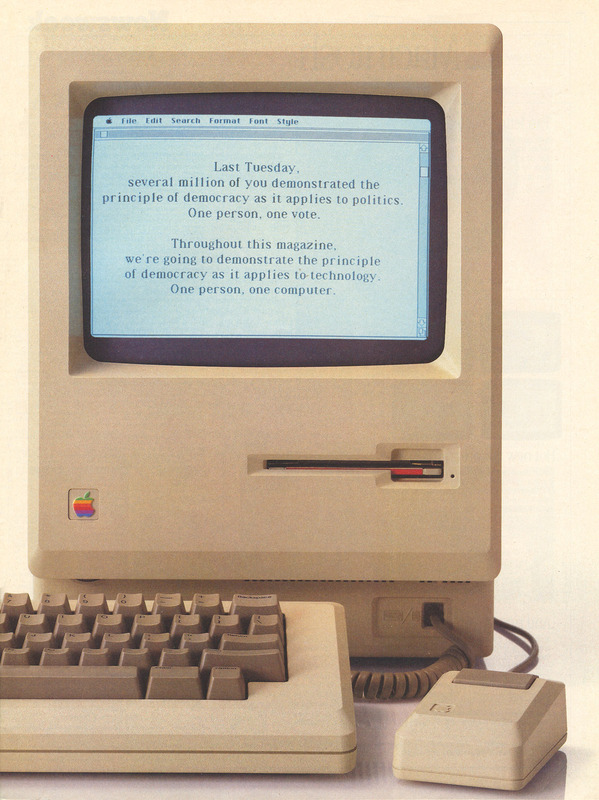 As is clear in the advertisement below that came out in Newsweek Magazine during the 1984 election cycle, the Macintosh computer was routinely touted as embodying the principle of democracy. While it was certainly more affordable than the Lisa (in that it sold for the substantially lower price of $2495), its closed architecture and lack of flexibility could still easily allow one to claim it represented a decidedly undemocratic turn in personal computing. Advertisement for the Apple Macintosh from the November/December 1984 issue of Newsweek Magazine. We have created for the first time in all history a garden of pure ideology, where each worker may bloom, secure from the pests of any contradictory true thoughts. Our Unification of Thoughts is more powerful a weapon than any fleet or army on earth. We are one people, with one will, one resolve, one cause. Our enemies shall talk themselves to death and we will bury them with their own confusion. And just before the hammer is thrown at the film-screen, causing a bright explosion that stuns the grey-clad viewers, the narrator finally declares, “We shall prevail!” But who exactly is the hammer-thrower-as-underdog fighting against? Who shall prevail – Apple or Big Brother? Who is warring against whom in this scenario and why? In the end, all that matters is that, at this moment, just two days before the official release of the Macintosh, Apple has created a powerful narrative of its unquestionable, even natural superiority over other models of computing that continues well into the twenty-first century. It is an ideology that of course masks itself as such and that is born out of the creation of and then opposition to a fictional, oppressive ideology we users/consumers need to be saved from. In this context, the fervor with which even Macintosh team-members believed in the rightness and goodness of their project is somewhat less surprising as they were quoted in Esquire earnestly declaring, “Very few of us were even thirty years old…We all felt as though we had missed the civil rights movement. We had missed Vietnam. What we had was the Macintosh”. Until that moment, when one said a computer screen “lit up,” some literary license was required…But we were so accustomed to it that we hardly even thought to conceive otherwise. We simply hadn’t seen the light. I saw it that day…By the end of the demonstration, I began to understand that these were things a computer should do. There was a better way (4). The Macintosh was not simply one of several alternatives – it represented the unquestionably right way for computing. And even at the time of his writing that book, in 1993, he still declares that each time he turns on his Macintosh, he is reminded “of the first light I saw in Cupertino, 1983. It is exhilarating, like the first glimpse of green grass when entering a baseball stadium. I have essentially accessed another world, the place where my information lives. It is a world that one enters without thinking of it…an ephemeral territory perched on the lip of math and firmament” (5). But it is precisely the legacy of the unthinking, invisible nature of the so-called “user-friendly” Macintosh environment that has foreclosed on using computers for creativity and learning and that continues in contemporary multi-touch, gestural, and ubiquitous computing devices such as the iPad and the iPhone whose interfaces are touted as utterly invisible (and so their inner workings are de facto inaccessible). “‘1984’ Apple Macintosh Commercial.” Youtube. 27 Aug. 2008. Web. 21 June 2012. Apple Computer Inc. Apple Human Interface Guidelines: The Apple Desktop Interface. Reading, MA: Addison-Wesley, 1987. Bardini, Thierry. Bootstrapping: Douglas Engelbart, Coevolution, and the Origins of Personal Computing. Stanford, CA: Stanford UP, 2000. Chen, Jung-Wei and Jiajie Zhang. “Comparing Text-based and Graphic User Interfaces for Novice and Expert Users.” AMIA Annual Symposium Proceedings Archive. 2007. Web. 14 February 2012. Chun, Wendy. Programmed Visions: Software and Memory. Boston, MA: MIT Press, 2011. Engelbart, Douglas. “Augmenting Human Intellect: A Conceptual Framework.” in The New Media Reader. Eds. Noah Wardrip-Fruin and Nick Montfort. Boston, MA: MIT UP, 2003. 95-108. —. “Workstation History and the Augmented Knowledge Workshop.” Doug Engelbart Institute. 2008. Web. 3 April 2011. —, and William English. “A Research Center for Augmenting Human Intellect.” in The New Media Reader. Eds. Noah Wardrip-Fruin and Nick Montfort. Boston, MA: MIT UP, 2003. 233-246. Gassée, Jean-Louis. The Third Apple: Personal Computers & the Cultural Revolution. San Diego, New York, London: Harcourt Brace Jovanovich Publishers, 1985. Goldberg, Adele. “Introducing the Smalltalk-80 System.” Byte 6:8 (August 1981): 14-26. Hertzfeld, Andy and Steve Capps et al. Revolution in the Valley. Sebastopol, CA: O’Reilly, 2005. Ingalls, Daniel. “Design Principles Behind Smalltalk.” Byte 6:8 (August 1981): 286-298. Johnson, Jeff and Theresa Roberts et al. “The Xerox Star: A Retrospective.” Computer 22:9 (September 1989): 11-29. Kay, Alan. “The Early History of Smalltalk.” Smalltalk dot org. Web. 5 April 2012. —. “User Interface: A Personal View.” in The Art of Human-Computer Interface Design. Ed. Brenda Laurel. 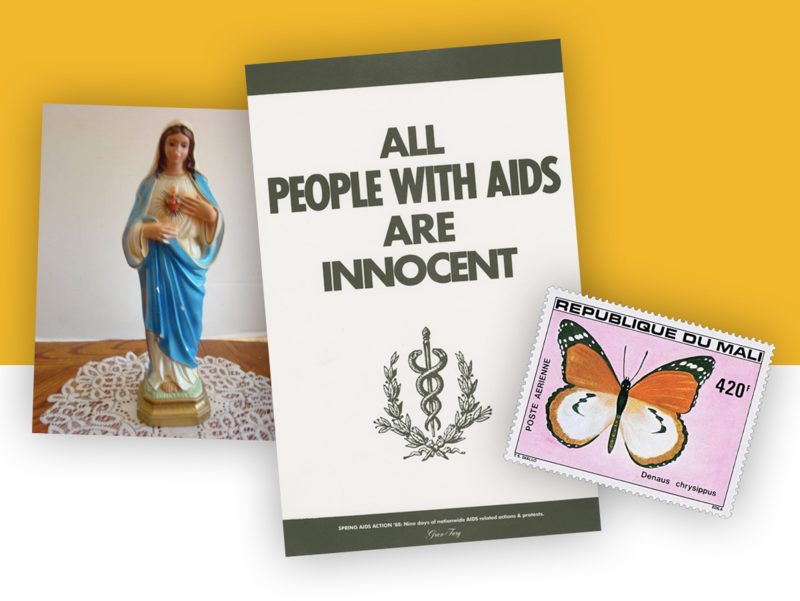 Reading, MA: Addison-Wesley Publishing Company, Inc., 1990. 191-207. —, and Adele Goldberg. “Personal Dynamic Media.” in The New Media Reader. Eds. Noah Wardrip-Fruin and Nick Montfort. Boston, MA: MIT UP, 2003. 393-409. Levy, Steven. Hackers: Heroes of the Computer Revolution. 25th Anniversary Edition. New York: O’Reilly Media, 2010. —. Insanely Great: The Life and Times of Macintosh, the Computer that Changed Everything. New York: Viking, 1994. Lewis, T.G. “Some Laws of Personal Computing.” Byte 4:10 (October 1979): 186-191. Linden, Ted, Eric Harslem, Xerox Corporation. Office Systems Technology: A Look Into the World of the Xerox 8000 Series Products: Workstations, Services, Ethernet, and Software Development. Palo Alto, CA: Office Systems Division, 1982. “LOGO.” Advertisement. Byte 7:2 (February 1982): 255. Morgan, Chris and Gregg Williams, Phil Lemmons. “An Interview with Wayne Rosing, Bruce Daniels, and Larry Tesler: A Behind-the-scenes Look at the Development of Apple’s Lisa.” Reprinted from Byte magazine 8:2 (February 1983): 90-114. Web. 14 April 2012. Nelson, Theodor. “Computer Lib / Dream Machines.” The New Media Reader. Eds. Noah Wardrip-Fruin and Nick Montfort. Cambridge, MA: MIT Press, 2003. 303-338. Reenskaug, Trygve. “User-Oriented Descriptions of Smalltalk Systems.” Byte 6:8 (August 1981): 148-166. Reimer, Jeremy. “Total share: 30 years of personal computer market share figures.” Ars Technica. 2006. Web. 4 December 2011. Rutkowski, Chris. “An Introduction to the Human Applications Standard Computer Interface: Part 1: Theory and Principles.” Byte 7:10 (October 1982): 291-310. —. “An Introduction to the Human Applications Standard Computer Interface: Part 2: Implementing the HASCI Concept. ” Byte 7:11 (November 1982): 379-390. Smith, David Canfield and Charles Irby et al. “Designing the Star User Interface.” Byte 7:4 (April 1982): 242-282. Tesler, Larry. “The Legacy of the Lisa.” Macworld magazine (September 1985): 17-22. Wardrip-Fruin, Noah. “Introduction.” “A Research Center for Augmenting Human Intellect.” By Douglas Engelbart. in The New Media Reader. Eds. Noah Wardrip-Fruin and Nick Montfort. Boston, MA: MIT UP, 2003. 231-232. “What is Logo?” The Logo Foundation. 2011. Web. 5 April 2012. Whiteside, John and Sandra Jones, Paul S. Levy, Dennis Wixon. “User Performance with Command, Menu, and Iconic Interfaces.” CHI 1985 Proceedings. April 1985. 185-191. Wilber, Mike and David Fylstra. 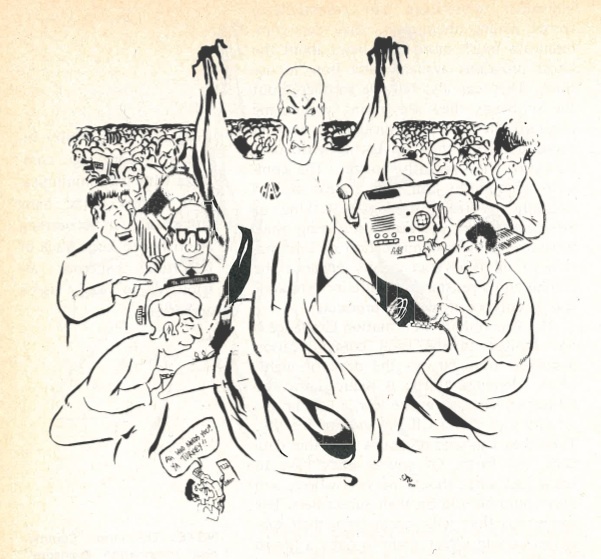 “Homebrewery vs the Software Priesthood.” Byte 14 (October 1976): 90-94. Williams, Gregg. “The Lisa Computer System: Apple Designs a New Kind of Machine.” Product Description. Byte 8:2 (February 1983): 33-50. Wozniak, Steve. “The Apple-II.” System Description. Byte 2:5 (May 1977): 34-43. I’ve been building a bibliography for awhile now of digital textuality/art apps for the iPhone and iPad. The list below is far from complete but hopefully useful to those of you teaching students how to read and/or write digital textuality/art. Some link directly to the download page while others link to pages with information on particular apps. Please let me know if you have any other works you think I should add to this list.